FHA One-Time Close construction loans are an important option to consider for those looking for a home in Texas. That market is an excellent place to consider building a home from the ground up with a One-Time Close (OTC) mortgage. 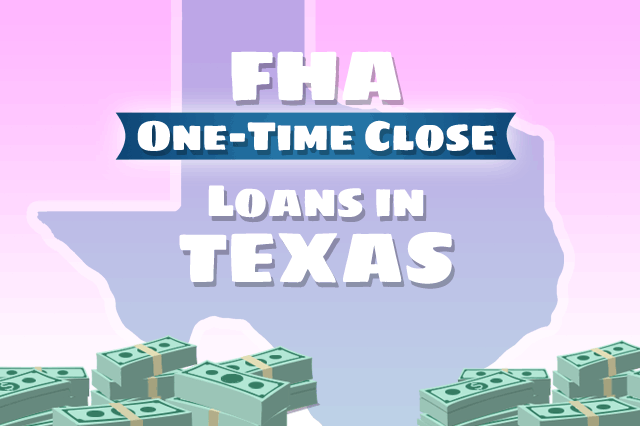 November 4, 2018 - FHA One-Time Close construction loans are an important option to consider for those looking for a home in Texas. The Texas housing market is an excellent place to consider building a home from the ground up with a One-Time Close (OTC) mortgage; A Zillow average home price report for 2018 lists the national average price at $218,000 with a predicted 6.4% increase over the following 12 months. Compare that with the Texas real estate stats listed by the same company; Zillow reports Texas the median home value as approximately $185,800, with a predicted 4% increase in the 12 months following that report. Texas home values have gone up 5.6% over the past year and Zillow predicts they will rise 4.0% within the next year. According to Zillow, the median price in Texas is about $125 per square foot, with the median home sales price at or near $275,000. In Texas housing markets such as Dallas and Houston, houses may sit on the market for 30 to 50 days according to some published reports; these same reports state that the (at the time of those reports), it’s a seller’s market with “persistent buyer demand”. For those trying to buy an existing construction home in some parts of Texas, the seller’s market may work against them, and the length of time a home sits on the market may be an indication that home prices in that seller’s market may be higher than some consumers care to pay. The persistent demand issue can also create an inventory shortage, which is one reason why borrowers may choose an FHA One-Time Close construction loan to build a home to suit their needs rather than trying to find that one perfect home in a competitive marketplace. High prices, short inventory, what is a borrower to do? For some the answer is building a home from the ground up with a One-Time Close construction loan. FHA OTC mortgages are a major improvement over the old construction loan process that forced borrowers to apply for not one, but TWO loans; one for the payment for labor, materials, and construction of the home and another loan that covers the actual mortgage. FHA OTC loans have a single application and closing date. No mortgage payments are required during the construction phase of the One-Time Close loan, and the borrower is protected from failing to qualify for a second loan and from rising interest rates during the construction phase. Lender requirements will apply for OTC loans including FICO score standards and other factors. Your FICO score requirements may be higher for a construction loan, but much depends on the lender. Ask your loan officer about qualifying FICO scores. It pays not to be in a hurry with a construction loan; your dream home needs time to be built, appraised, and inspected. Some housing markets may have longer-than-usual construction permit processing times and while this has nothing to do with the loan approval procedure itself, it has the potential to change the time required to get all the necessary paperwork and permissions to build. We have done extensive research on FHA / VA / USDA One-Time Close mortgages and spoke directly to these licensed lenders for most states. These are qualified mortgage loan officers who work for lenders that know the FHA One-Time Close product well. Each company has supplied us the guidelines for their product. If you are interested in being contacted by one licensed lender in your area, please respond to the below questions to save time. All information is treated confidentially. Your response to onetimeclose@fha.com authorizes FHA.com to share your personal information with a licensed mortgage lender in your area to contact you. Please note that the FHA / VA / USDA One-Time Close Construction Program only allows for single family dwellings (1 unit) – and NOT for multifamily units (no duplexes, triplexes or fourplexes). 1. Send your first and last name, e-mail address, and contact telephone number. 2. Tell us the city and state of the proposed property. 3. Tell us your credit score and/or the Co-borrower’s credit score, if known. 620 is the minimum qualifying credit score for this product. 4. Are you or your spouse (Co-borrower) eligible Veterans? Yes or No. If either of you are eligible veterans, the down payment is $0 up to the maximum VA lending limit for your county. If not, the FHA down payment is 3.5% up to the maximum FHA lending limit for your county.